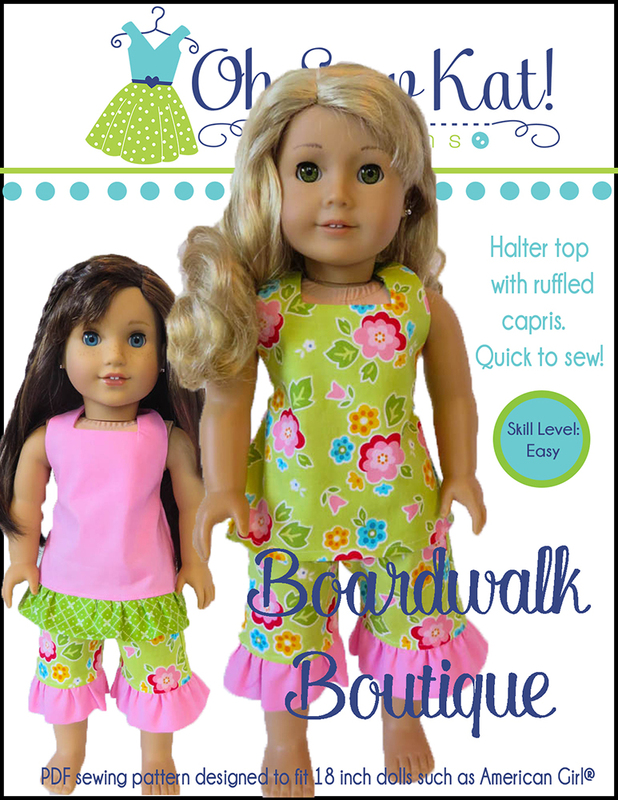 Bloomer Buddies – Oh Sew Kat! 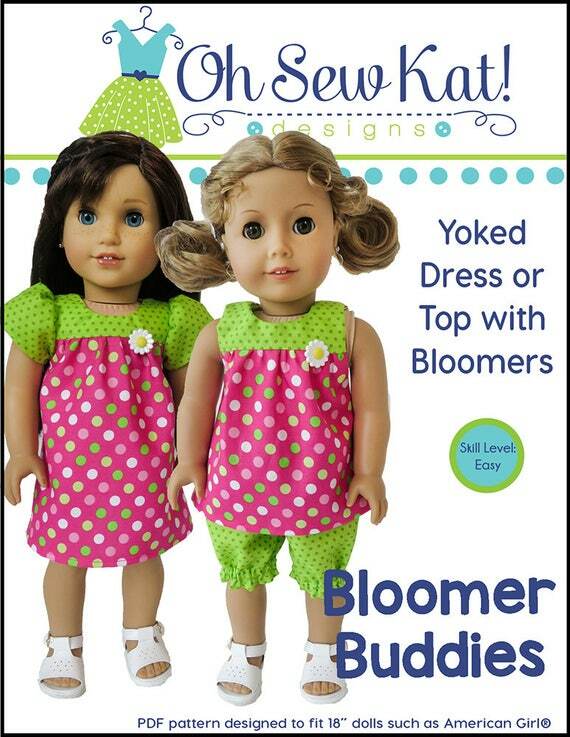 The Bloomer Buddies pattern is currently available in 3 sizes, for 18 inch dolls, for 16 inch Disney Animators’ dolls, and for 14.5 inch Wellie Wishers/Glitter Girls sized dolls. Find the pattern HERE. 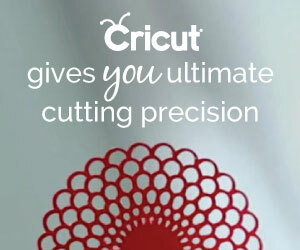 Cut out all of your pattern pieces, including the sleeve. Fold your paper along the sleeve’s fold line, or tape it to the top of a new sheet of paper that is folded in half lengthwise and cut it out. You now have a full sleeve piece. 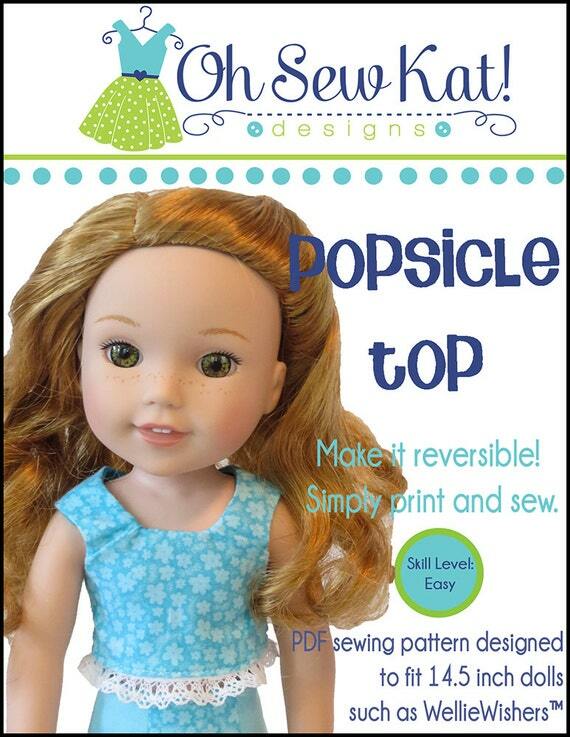 Measure your dolls arm, from the center point between the shoulder and elbow, down to the wrist where you want the sleeve to end on your doll. On your new sheet of paper, measure down from the bottom corners of the sleeve this same amount and extend those side lines. Connect the ends of these new lines across the middle in a straight line. 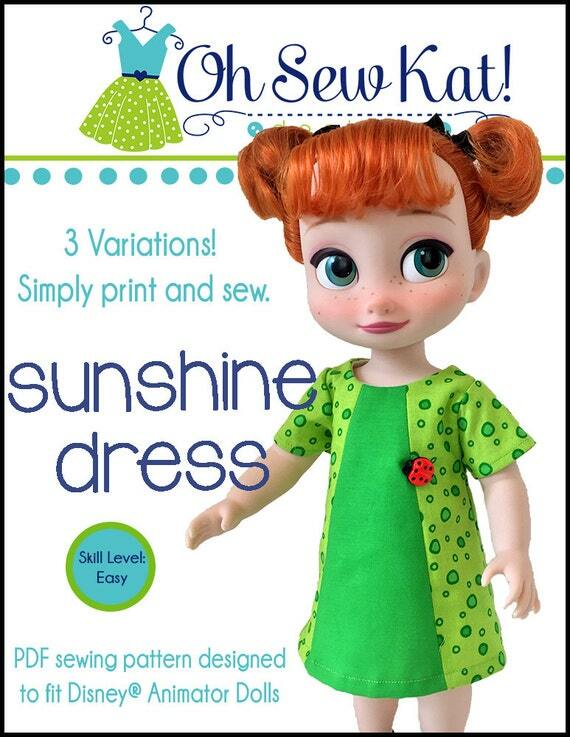 Cut out your new sleeve pattern piece and follow the pattern instructions to make the top or dress. 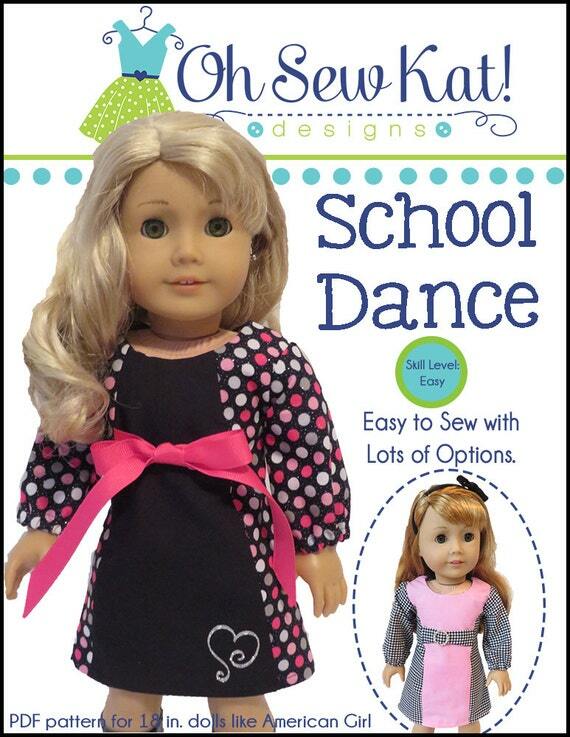 For my polka dot dress shown here, I extended the sleeve by 3 inches for the 18 inch doll. If you are not using any trim at the cuffs, use 3 1/2 inches. What other short sleeve patterns do you have that you can also make with long sleeves or vice versa? 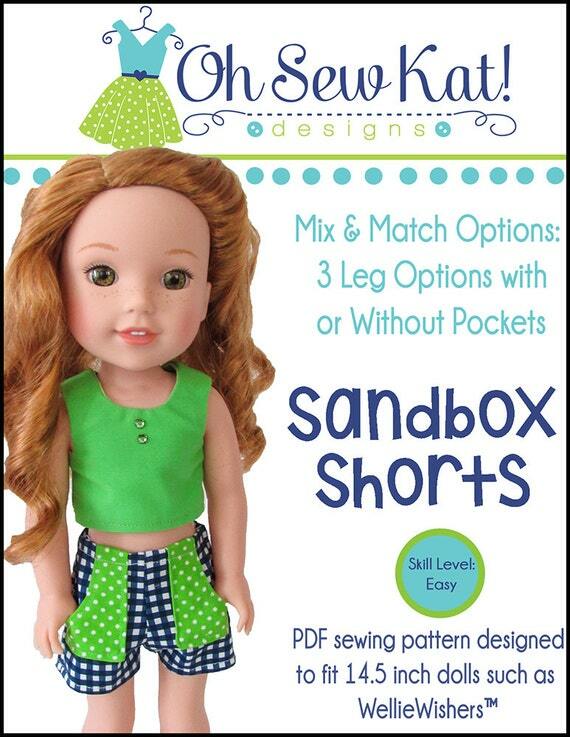 Find more tutorials and pattern hacks on the Tutorials page. 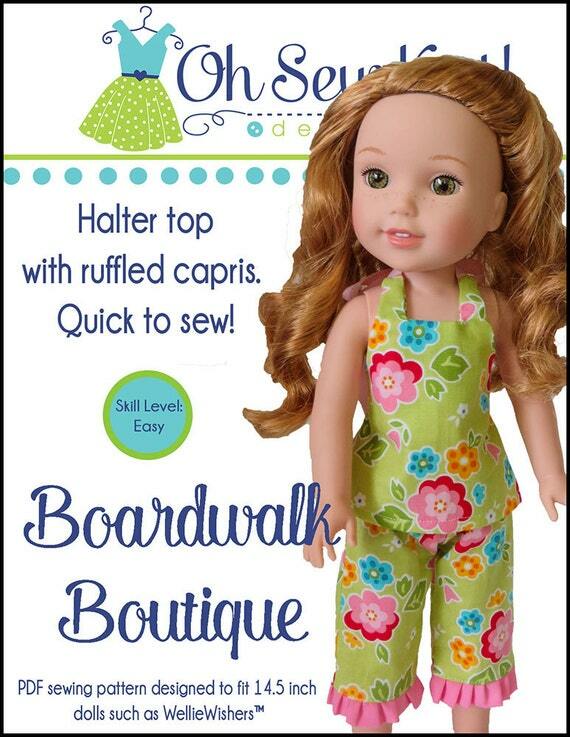 Visit the Bloomer Buddies Inspiration Gallery HERE. 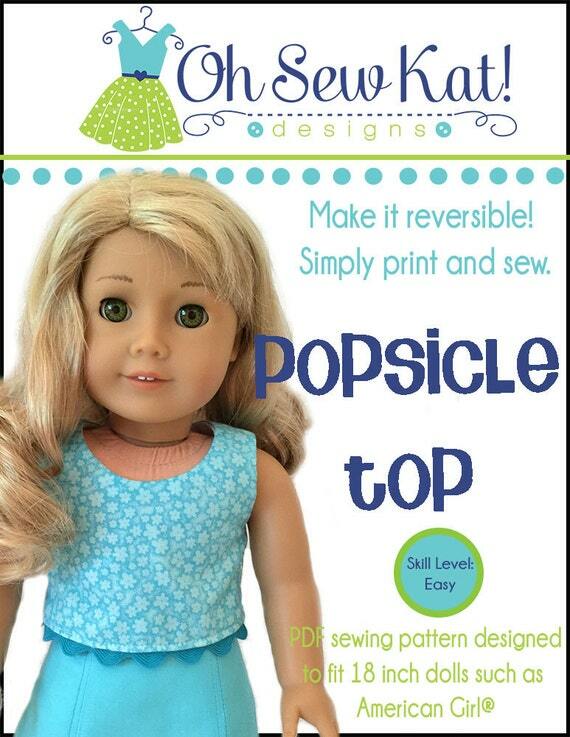 Here is an easy 1970s style top to make for your American Girl doll, Julie. Julie is the BeForever character from 1974. I was seven years old in 1975, and I had a top that looked just like this one, red fabric and all, but the print was of mushrooms. I used “Little Ruby” fabric for this imitation calico top and the Oh Sew Kat! 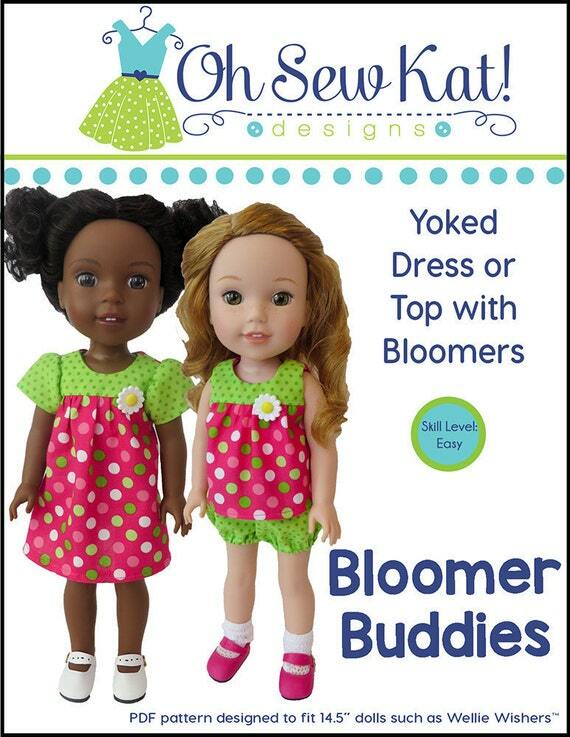 Bloomer Buddies sewing pattern. It’s easy to add pockets to any pattern, especially square pockets. I add the pockets after the front is complete, before I add the sleeves as it’s a little easier to work with a flat item than a rounded one. Figure out what size you want your finished pocket. On this blouse, my pockets measure one inch square. Add 1/2 inch to the width, and the length for seam allowances. I cut my pieces 1 1/2 inch square. With right sides together, sew three sides of the pocket, and turn right side out. Press well, folding the unfinished edge to the inside. 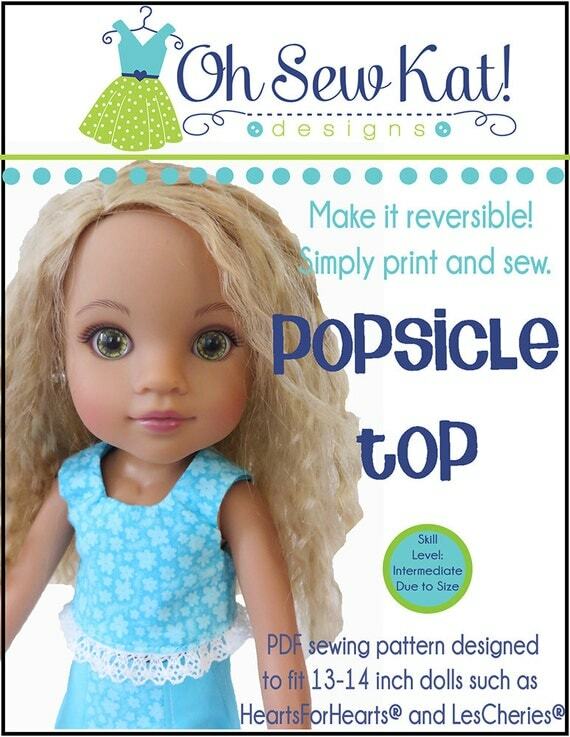 I put my top on my doll, and use scotch tape (the magic, transparent kind) to hold the pockets in place. It’s easier to sew over tape than pins that are longer than your pocket! Use a top stitch or edge foot if you have one to get nice topstitching around the three lower sides of the pocket. Complete the top as directed by the pattern. Complete the 70s inspired look with an easy headscarf. Find the full tutorial HERE. 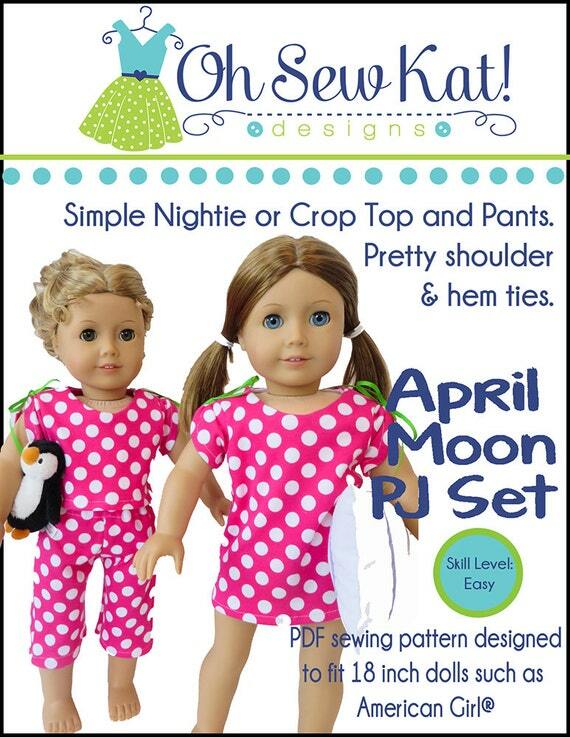 What other outfits will you make for your Julie doll or her friends? Find more 70s inspiration here in my Inspiration Gallery, as well as here and here. Don’t forget to visit and follow my Julie inspired Pinterest board! 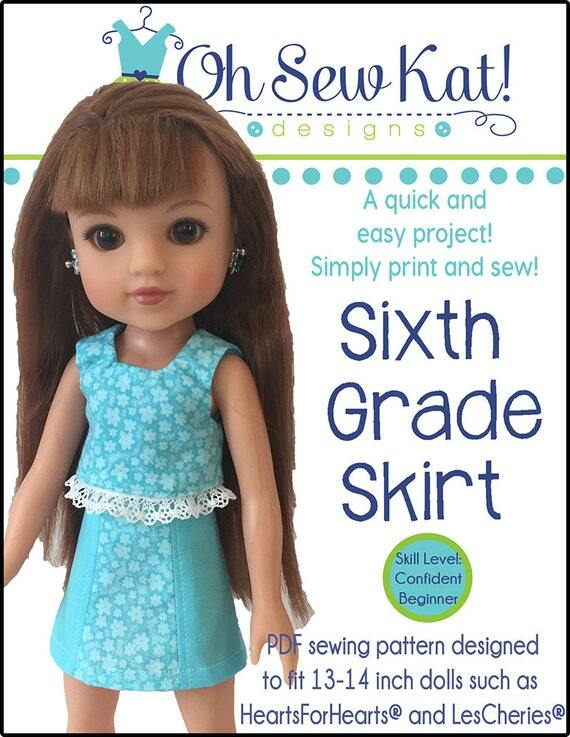 BeForever character, Maryellen Larkin, is a ten year old girl living in Florida in 1953. Fifties fashions were all about fun prints, gingham, and full skirts! 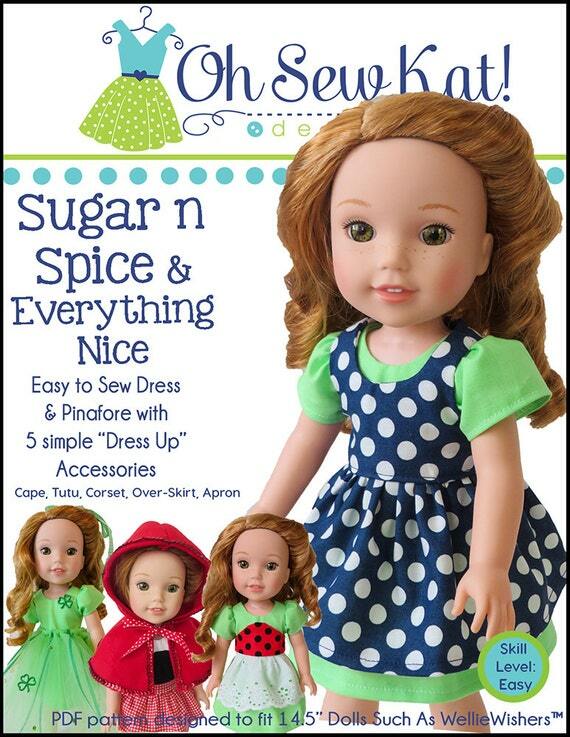 With just a few modifications, you can make a cute 50s style dress and scarf for your Maryellen doll (or her friends) using the Bloomer Buddies pattern from Oh Sew Kat! I used THIS PIN from my Maryellen Pinterest board as my inspiration. Make the scarf from matching fabric from THIS tutorial. First, you need the pattern. Find it here. The pattern has a little slimmer silhouette than the pinned image. I made two modifications when I cut out my dress. Move the dress center front fold about 1/2 inch. 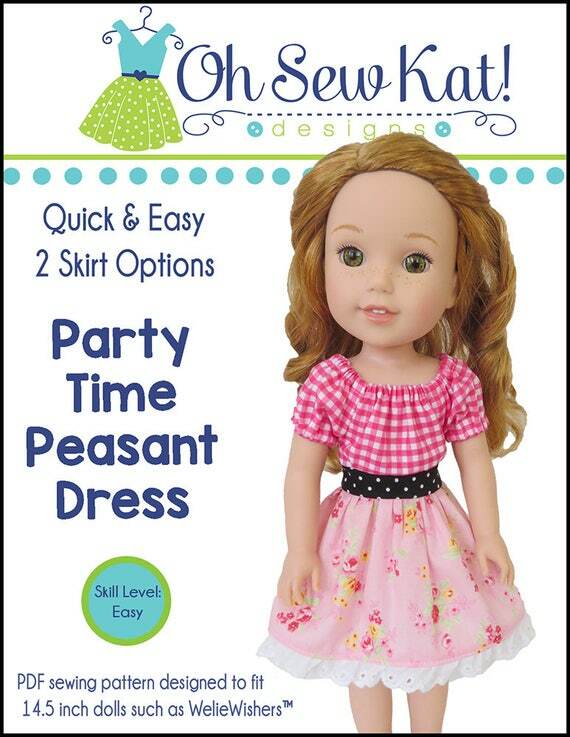 This will give an extra inch of fullness to the front of the dress. You do not need to change the lining, as the finished front will still be the same size, just have more fullness. 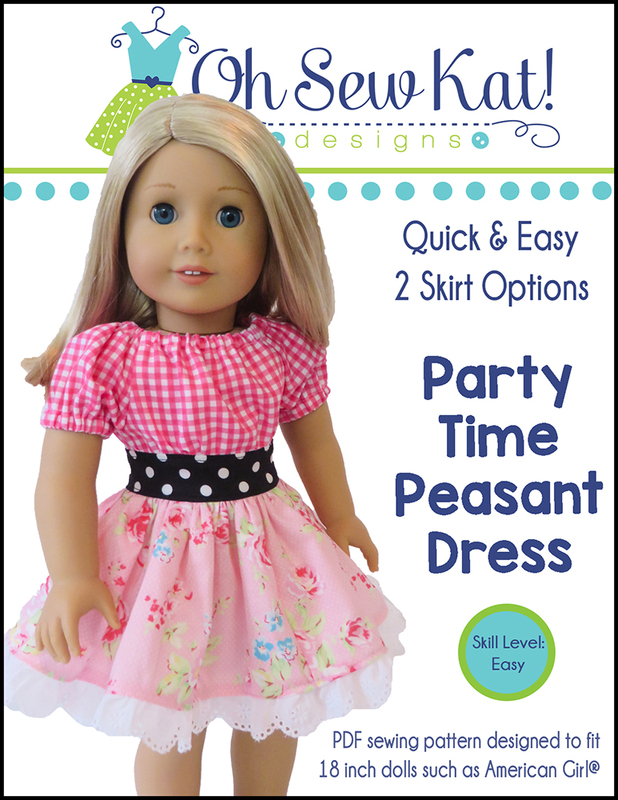 Add pockets to your dress front before you gather it and sew it to the yoke. Even though you can do it after, it’s just easier to work while it’s still flat. I made my pockets so they would be two inches square when finished. I used one edge on the fold, so my pocket pieces were 4.5 x 2.5 inches. Press in all edges by 1/4th inch first. With right sides together, fold in half and stitch the two short sides, plus the corners and some of the long side, leaving a 1/2 inch opening to turn. Turn and press, tucking in your opening along the crease lines. Top stitch the top edge if desired, then add to the front of the dress where the hands end up, stitching around both short sides and the bottom. 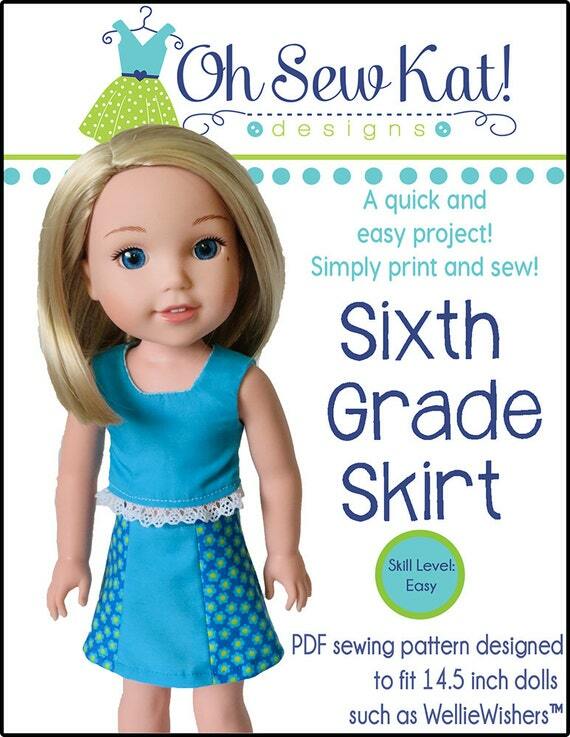 Make the dress according to the pattern instructions. To make a matching head scarf, click HERE for the tutorial. 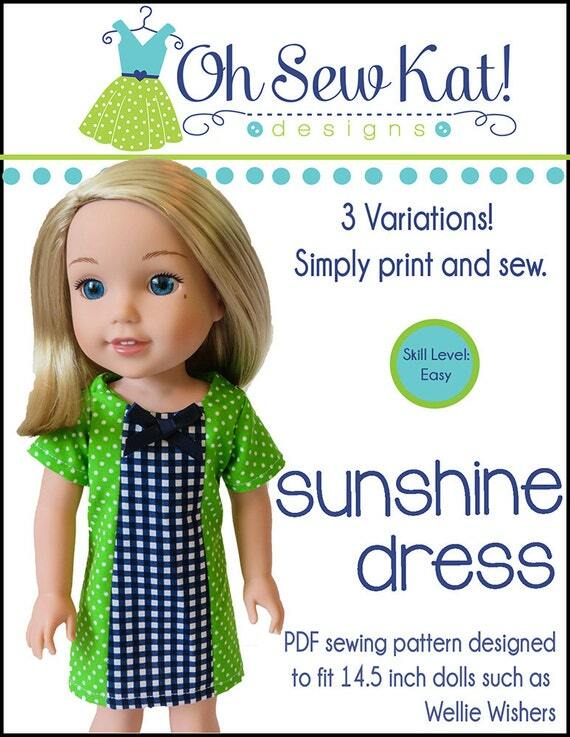 Click here to see the Sunshine Dress made for 60s character, Melody Ellison and HERE to find the headscarf tutorial. See more ideas for Maryellen HERE.